On Friday, March 6 Four Seasons Resort Orlando at Walt Disney World® Resort restaurant PB&G will be hosting an incredible 6-course guest chef dinner with amazing beers from Cigar City and Funky Buddha. The dinner will be prepared by chef Jenny Cleveland and James Beard Award nominatee chef Ed Heath from Cleveland-Heath restaurant in Edwardsville, Illinois in collaboration with PB&G Chef Gerald Sombright. The beer pairing lineup will feature sought after favorites including Funky Buddha’s Last Snow Coconut-Coffee Porter, More Moro Blood Orange IPA and Cigar City’s Puppy’s Breath Porter and Evander Belgian White Ale, along with other favorites. Tickets are limited and cost $75 per person, inclusive of tax and gratuity with additional pairing options including the mentioned local breweries and wine pairings from Four Seasons Orlando Sommelier Jill Davis. 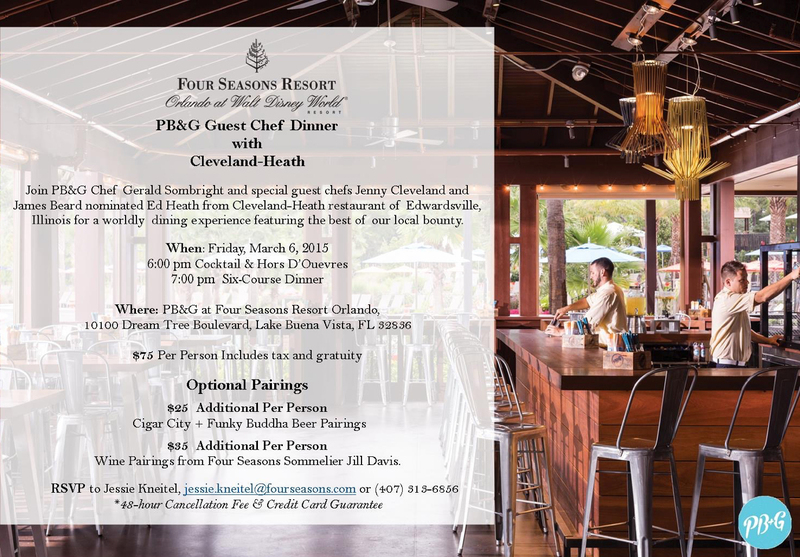 In order to reserve your reservation please contact Jessie Kneitel at Jessie.kneitel@fourseasons.com or by calling (407) 313-6856. NOW OPEN: Four Seasons Resort Orlando at Walt Disney World® Resort is a stunning lakeside resort unlike any other. Set amid lush Florida woodlands, the resort offers five restaurants, a sumptuous Spa, Tom Fazio golf at Tranquilo Golf Club, an adult only pool, a 5-acre waterpark, and much more.